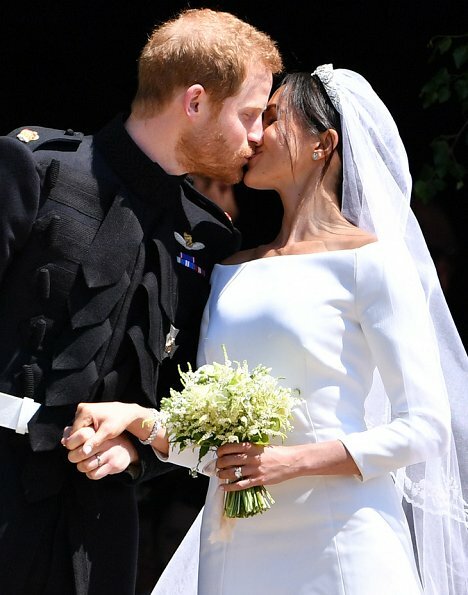 Grandson of Queen Elizabeth II of England, and 6th heir to the throne, Prince Harry got married to American actress Meghan Markle- Prince Harry took the title of "The Duke of Sussex" and his wife Meghan became "The Duchess of Sussex". 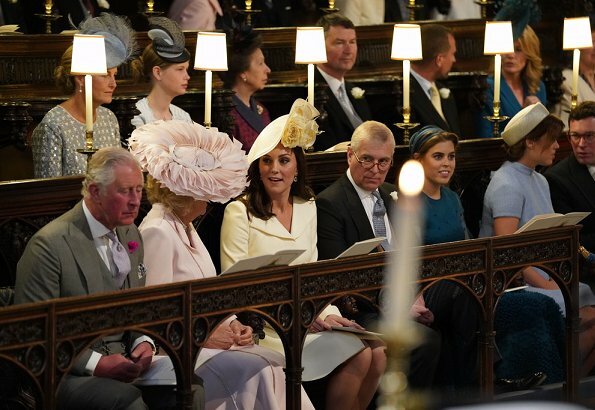 All members of the royal family, including the Queen, her husband the Duke of Edinburgh, Prince Philip, Duke William of Cambridge and his wife Duchess Catherine attended the wedding at St. George Chapel which is the historical temple of Windsor Castle in west of the capital, London. 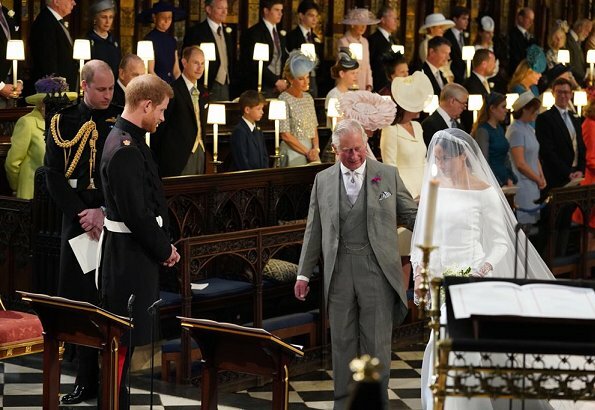 Meghan Markle took Crown Prince Charles’s arm, who is her father-in-law and walked through the main corridor of the church and thereby the religious ceremony started. The ceremony was directed by Archbishop Justin Welby of Anglican Church Canterbury. Meghan Markle did not choose a maid of honor for herself, but Prince Harry's groomsman became his elder brother Prince William. 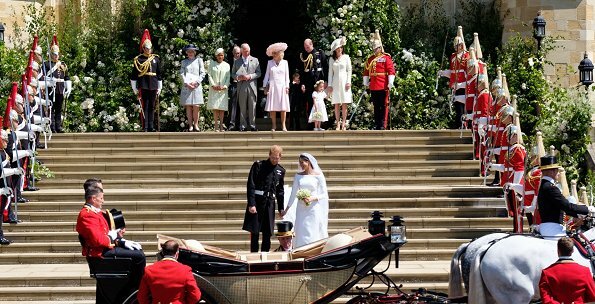 All of the other maids of the couple were children including 3 years old daughter of Prince William and Duchess Kate Middleton of Cambridge. 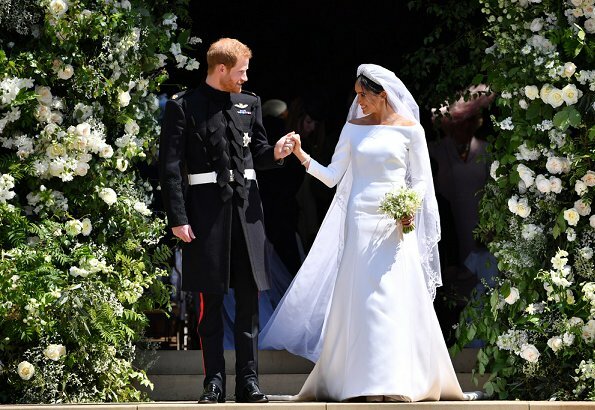 Meghan Markle wore a silk organza boat neck long sleeve wedding dress designed by famous British designer Clare Waight Keller. Mrs. Waight Keller is the art director of French fashion house Givenchy. 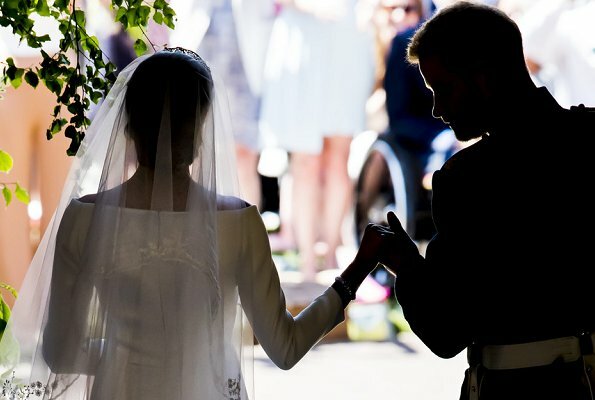 According to the royal traditions, it is important that the wedding dress should be designed by a British designer and that the sleeves and breast section should not be too much decollete. 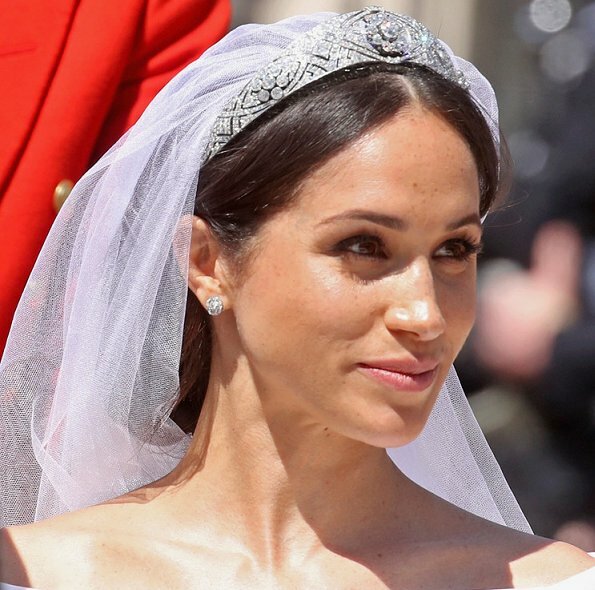 At the wedding, Meghan wore Queen Mary's diamond bandeau tiara lent by Queen Elizabeth. The ring of Mrs. Markle is a gift of the Queen, which is manufactured from a Welsh golden piece. Families, relatives and friends of the couple and in addition 2.640 people were invited to the year’s wedding. That invitee list involves servants of the royal family, foundation employees, children and some of the Windsor residents. Some of the world famous invitees of the wedding are star tennis player Serena Williams, Amal-George Clooney and Victoria-David Beckham couples. Prince Charles of Wales will hold a reception at Frogmore House which is at a distance of nearly 1 km from Windsor Castle in honour of the couple this evening. Only the relatives of the family will attend that reception which has 200 invitees. Beautiful Wedding,the bride is fantastic,almost everyone looked grand. I think Pss Anne could have done way better.Zara seemed to have a little discomfort well no wonder, I hope the little boy or girl comes into the world any day now. Good Luck to her. I agree with you re Princess Anne; she has done so well in recent years, but this seems a bit of a throwback to unbecoming former times. Eugenie's dress fit really beautifully, yay! (Could have been longer, but under the circumstances I'm not complaining!) Her pillbox hat completed a neat, tidy and tasteful look making her one of the day's best-dressed, imo. Beatrice wore a beautiful color, but the overly froufrou skirt on her dress looked cumbersome and awkward. I love Kate's pale yellow ensemble, but for this occasion I wish it had been just a slightly deeper shade, so that she'd have avoided criticism! Well said Jane Chantal, I agree and remark that Lady Kitty Spence to me as well was looking very beautiful. This time the York-Sisters looked really Young and fresh, charming, graceful and amazing, much better than Catherine in her white bridal dress. 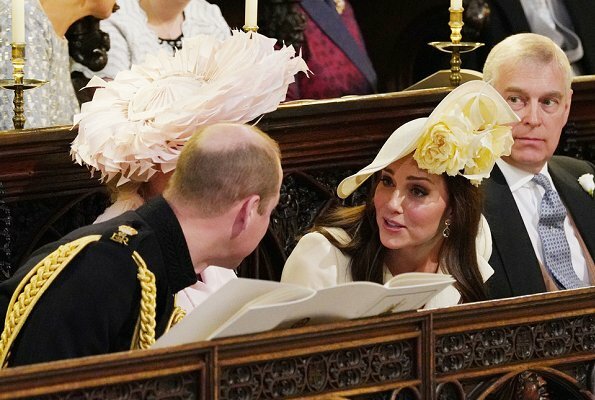 Love Kate's dress and hat! Both Sophie and Zara looked very pretty! It is actually the third time. The first was to Charlotte's christening. The second to Trooping the color in 2016. I have loved it each time. She wore it in Belgium too. Is it a problem if Catherine wears a dress several times? She looks beautiful, so why wear it only once? I wish them all peace,love and happyness. 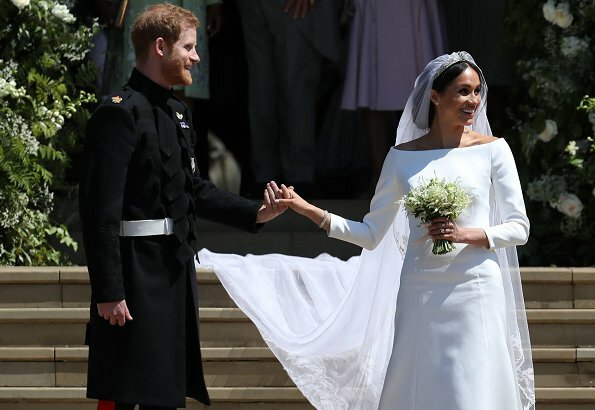 I except this kind of simply amd minimalistic gown from Meghan but in my opinion it 's too plain and with a bit of decorations -maybe with silk belt or lacy it can look more stunning.New duchess looked amazing but it isn 't my favourite wedding gown.I still prefer Kate,Queen Elisabeth, Madeleine and Marie. True @Karolina it was an extremely minimal plain gown, nothing exciting! The tiara is great thou. This is not the wedding of an heir to the throne and therefore it is not a State Event to which they would be invited. It's a private family wedding. It's the brides choice to have whichever family members of hers she wants to be present. She chose only her mother and father. This dress is really, really nothing special. I am disappointed. Especially it is NOT royal. Sorry, but when else there should be pomp, if not at a wedding. Of course the dress is good fitted, but that is the minimum, I think. And the hair is as well discussed before. I can't believe that it is not possible for a top coiffeur to put the strands in place. And especially I do not like the shy attitude she always performs. Sorry, but this is my impression. She is a 36 year old woman. I would like to conclude my not so positive comment with the addition, that I normally often like her style. Anonymous I totally disagree with you. She was absolutely perfect. Simple, beautiful and elegant. The tiara was perfect for the dress too. In terms of the shy attitude you refer to, I think you are mistaken it for a quiet dignity. Anonymous, i cannot agree with you more! christine, the quiet dignity looks so fake to me. Totally agree with you. Very disappointing. No Wow factor. Her hair was horrible. The dress average. I agree with the weird attitudebshe puts on to try and fit in. My impression too. Not even on her wedding she can have tidy hair? As for her shy or whatever attitude - I think she is immodest. Don't know if I call it immodest but I get what you're saying. I think she tries to act coy and innocent to a degree not a mature 36 year old woman who has been married before and is quite worldly. I can't help but think it's a great job of acting she does when in the spotlight. Doesn't mean I don't think she is in love with Harry because I do think she is but I don't think she is portraying her true self. I can't say that she really wowed me today. Usually on your wedding day you want to look special. She looks no different than she has on other royal outings. She would have looked better with a more sleek hairstyle sans the middle parting of her hair. Her make-up was bland. Maybe some light pink blush to give her a little color, and she could have played up her eyes more. Dangle earrings to show off more. May favorite wedding gown is still Princess Grace of Monaco. Why no royal families from Europe were seen on this wedding? No Charleen, no Madeline... etc. What was the reason? There was no other countries Royalty there because 1) this was not the wedding of an heir to the throne and therefore 2) this was not a state affair or event. Instead this was a 'private family wedding' for all intents and purposes. Even some past and present heads of Government who were invited not because of their position but because they are personal friends of one or both of the married couple declined to attend but with very best wishes (and still friends). This is the first time I have ever seen Beatrice look better than Eugenie. We were there! It was a spectacular day enjoyed by .... many, many! "...the fact that the frogs are deep blue dyed dough skins!" Sorry Liza, what do you mean by that? Ah, ok! Thank you Liza. I appreciate that. I was wondering about the fabric of those uniforms - very unusual and I have not seen it before - and now thanks to you, I know what it is. The new Duchess of Sussex is in the class on her own. Her style has already been clearly established; her wedding dress has had confirmed that beautifully! Classic, impeccable, intriguingly simple, timeless. The groom surprised me only on the grounds of the uniform material: I was never aware of the fact that the froks are deep blue dyed doe skins! Thank you royal.uk for that ! another note going to my research notebook. Some of the dresses are very nice,Eugene has Jackie O style Beatrice is lovely just don't like the sleeves. I don't know what Anne was thinking,her outfit looks like a silk robe. Most of the wedding was very much in an American way/style, but Meghan's gown wasn't in its minimalistic classic style as royal gowns in 'the old fashioned way' without any laces: For example the gowns of the Queens Silvia (! ), Anne Marie, Maxima……and CP Mette Marit and CP Victoria. Meghan looks amazing as Harry said to her in the church! Agree with. A very old silk dressing gown. She worn the same outfit to a wedding/ function a couple of years ago. I wish a happy marriage to Prince Harry and Meghan Markle. Considering the fact that the bride is divorcee and also a bit older, as she is approaching 40, such simple wedding dress is quite appropriate. Perhaps the veil is even needless...in my opinion. Otherwise, I wish them all the best and God bless! 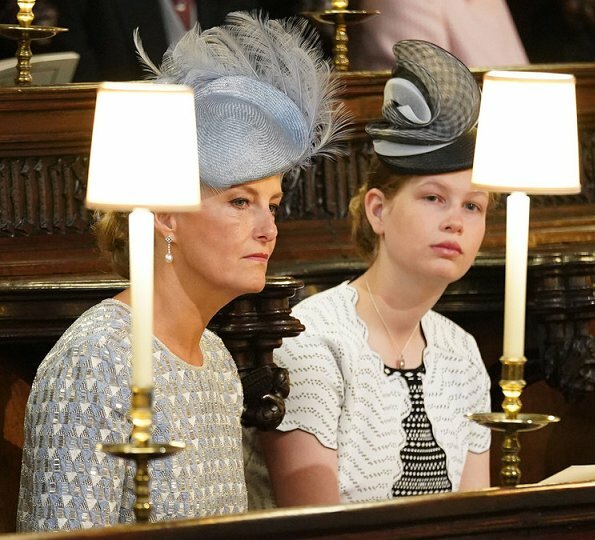 As I understand Black is reserved for funerals, however Lady Louise wore Black and that hideous hat, come on she is a Beautiful 14 year old and should have wore something light and happy. I thought Meghan's dress did not fit quite right around the waist /stomach area. Maybe is just me. Her mother looked very good, I loved the color of her outfit, but Who was the woman sitting next to her? Eine sehr schöne Braut und Bräutigam . Das Kleid ist eine schlichte Eleganz und das i-Tüpfelchen ist die bestickte Schleier. Sie war sehr elegant. Aber Harry hat mir auch sehr gut gefallen, die Uniform war schick und sah bei Harry sehr gut aus und mir gefiel es besser als Williams rote Uniform. While I admire this wedding gown, I can understand some of the disappointment expressed by those who would have liked to see something more lavish and elaborate. I think that this bride was kind of in a "d*mned if you do, d*mned if you don't" position: if she had chosen a very grand dress with billowing skirt and loads of lace, beadwork and crystals, and requested a large tiara, she probably would have been criticized as trying to be "more royal than the royals" and outshine the Duchess of Cambridge's lovely but fairly low-key wedding look. Under the circumstances, I think that her choice of a simple, elegant dress, small tiara and small bouquet was very diplomatic and wise. 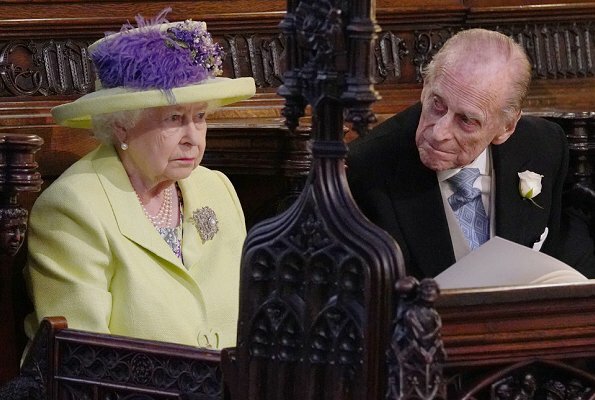 Sadly the Queen did not even try to smile,her Grandson finally married the girl he want's to share his life with. Very impressed with the DOE he walked very well even without a cane,he wanted to do this to honor dis Grandson and his wife to be and he did it so happy for him. Zara Tindall's makeup was the best I ever seen on her, but she was really not in a comfortable state one could see it on her face, the high heel did not make it any better. 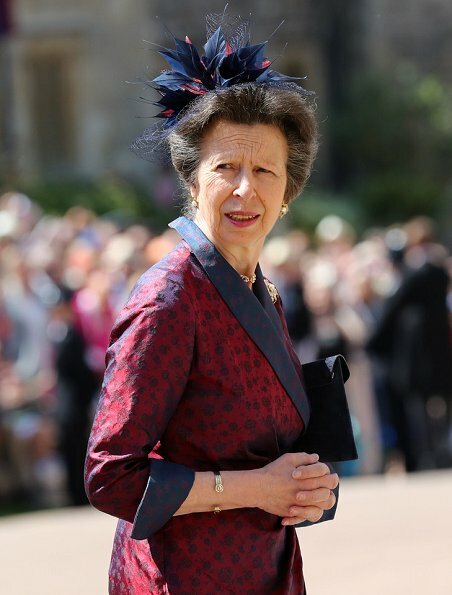 Pss Anne's dress looked like she wore her husbands robe because she could not find anything in her Wardrobe,really Anne, this was just as bad as the one she wore at Charles and Camilla',s wedding, I think it was the one with sunflowers all over. Eugene tries Jackie O style I like it.Beatrice dress was really nice but the sleeves should have been lined too, maybe MO only. I like both the dress and the hairstyle. The hairstyle is very Meghan just as Diana’s hairstyle at her wedding was very Diana (at that time). Although that’ s the only similatity I can see between those two weddings. She was looking her best at her wedding day, what more can we really ask. I loved the simple, stylish gown without any candyfloss effect. Also the veil was so beautiful, tiara was perfect and her make up nice. And they both looked so much relaxed and in love. One of the best royal appearances at bride´s part. I thought Meghan's gown was beautiful. I liked the simple, elegant design. The choice of tiara, earrings and bracelet were perfect. 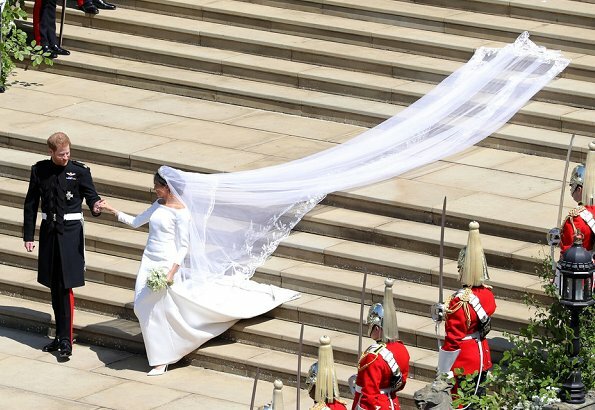 I have a mixed opinion on Meghan's veil. At times it looked magnificent trailing behind her and at other times I kept thinking "It is going to get caught on something and tear", her veil seemed a little too long, although as I said earlier in some shots it looked magnificent and the gesture of having a flower from each of member of the commonwealth embroidered around the edge of the veil was a beautiful gesture. Doria Ragland looked lovely, her outfit was very elegant and I loved the colour. It was nice how it was different but didn't clash with what the Queen was wearing. Catherine's ensemble surprised me. On television it looked white. On every other occasion I had seen Catherine wear it, it looked white, so I was very surprised to learn that it was in fact a very pale yellow. Catherine looked lovely, but perhaps wearing something that didn't show up as white on television might have been a better choice. The page boys and flower girls were gorgeous! 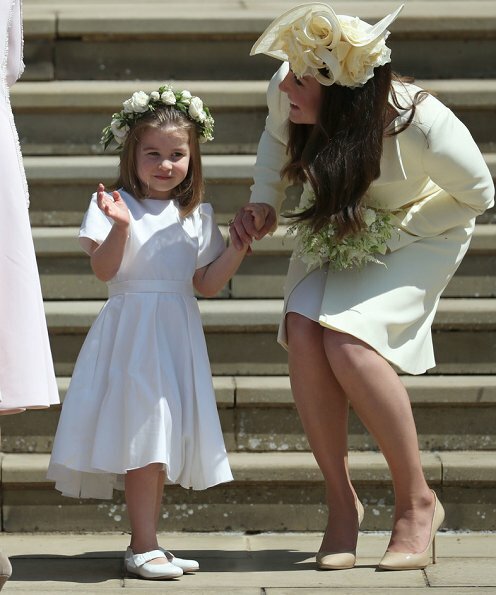 Princess Charlotte is adorable, she looked gorgeous too. The York sisters didn't thrill, but they weren't dressed and outrageously as they were at William and Catherine's wedding which was a relief. Both girls were dressed unlike their usual selves, perhaps warnings were issued.